When I was younger I would change my favourite animals, colours, numbers, etc pretty much every month. However, I clearly remember that for an entire two year period my favourite animal was the Canadian lynx! I loved their cute ears and giant paws! I still find the Canadian lynx a fascinating creature and would love to see one in the wild. Here is some neat information about the Canadian Lynx! Distribution/Location: The Canadian Lynx lives in North America. They are most common across Canada and a select number of northern states, but may also be seen in southern states such as Oregon, Wyoming, New Mexico, etc. Distribution of Canadian lynx in North America. Unfortunately, lynx have become much less common in the United States. Due to urban sprawl from things such as highways, deforestation, and recreational development, the Canadian lynx are losing their habitat. This has led to the need for reintroduction in Maine, Minnesota, Washington, and Colorado. In the other states (specifically the lower 48 states) the Canadian lynx is listed as an endangered species. Appearance: Canadian lynx are approximately 60 centimeters (2 feet) in height and 5-12 kilograms in weight, so they are classified as a medium-sized wildcat. The ears of the lynx are very distinct; they are triangular with a tuft of black fur at the top of each ear. Lynx also have two larger tufts of fur on either side of the chin, giving them a flared beard appearance. Lynx have a thick coat of fur, which is usually grey in color but may also have tints of red and white. Some lynx may have spots along the fur of their legs and their underbellies. The paws of the Canadian lynx are very large compared to their body, allowing them to walk through the deep snow more easily. The Canadian lynx hind legs are noticably longer than its front legs. Unlike other wild cats, the tail of the lynx is short—ranging anywhere from 9 to 12 centimeters in length—with a tip of black fur. Diet: Canadian lynx are carnivores that hunt in the forest. They are considered mid-sized predators so their prey tend to be smaller rodents such as mice, red squirrels, voles, etc. They may also feast on different birds (willow ptarmigans and grouse for example) if they are able to catch them. Their prey of choice is the snowshoe hare, so the Canadian lynx will typically inhabit areas with an abundant snowshoe hare population. Hunting: When it comes to hunting, lynx are solitary creatures. They tend to be more active during the night rather than the day. Their eyesight is excellent, even in the dark, which is a great tool for their nocturnal lifestyle. Their whiskers can also be used to sense prey in the dark. Lynx are very sneaky hunters; they hide in hunting beds or trees while they wait to pounce on their prey. 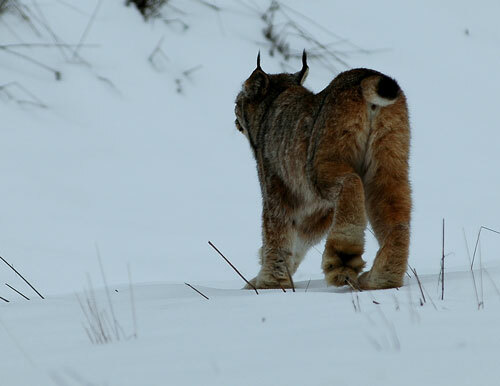 Lynx are excellent forest and snow hunters. Amazingly, they can find small rodents burrowed beneath the snow. Plus, their quick reflexes help lynx catch their prey, even when deep snow makes moving around more difficult. 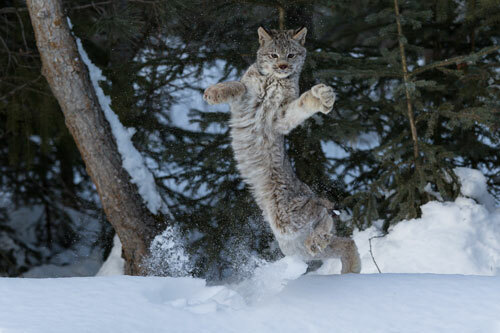 It is especially handy that the paws of the Canadian lynx act like snowshoes. 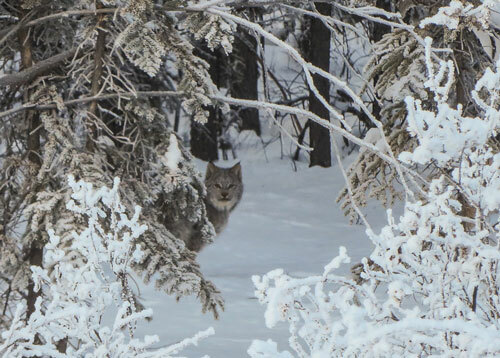 Habitat: Canadian lynx most commonly inhabit boreal forests. These forests tend to be dense but mostly filled with younger trees that still provide adequate shelter. The young and dense forests tend to result when a wildfire occurs in a mature forest. 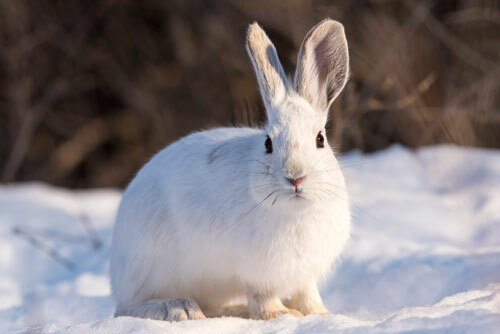 These habitats are ideal because their favourite prey (snowshoe hares) are common in these regions. Lynx are nocturnal animals (meaning they are more active at night), so during the day they will often sleep in a shelter underneath fallen trees or rock ledges. These amazing creatures must be able to travel through swampy, boggy, rocky, and snowy areas. Canadian lynx have special adaptations to help them survive and thrive in diverse habitats. In terms of snow, the Canadian lynx use their thick fur coat to keep them warm and their large snowshoe-type paws to help them move through deep snow. Mating: Canadian Lynx will mate during the spring months (March to May). Mating only lasts for one month, and whether it occurs in early or late spring depends on the weather conditions. The mating season is very quick because lynx are solitary creatures. After mating the male lynx will not have anything to do with raising the young kittens. Breeding: After mating Canadian lynx are pregnant for about two months before giving birth to a litter of kittens. Lynx have been known to give birth to up to 8 kittens in one litter. However, most litters have an average of 2 to 4 kittens. Kittens will stay with their mother for a year after birth; they will learn to hunt and survive in the forest environment. This is actualy the only time that lynx can be found hunting in groups. 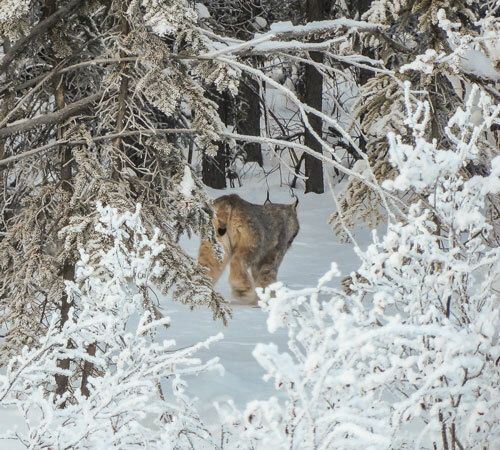 While caring for their young, Canadian lynx will create dens in mature forests because there is excellent coverage in the undergrowth and fallen trees of developed forests. They keep their kittens safe in depressions in the ground, under trees or shrubs, or underneath rock ledges. Young Canadian lynx will reach maturity at different times depending on their gender and the amount of prey available. Female lynx will reach maturity in less than a year if they have access to plenty of prey. If there isn't enough prey to sustain quick growth, then female lynx may take 2-3 years to reach maturity. Male lynx take at least two years to reach maturity. 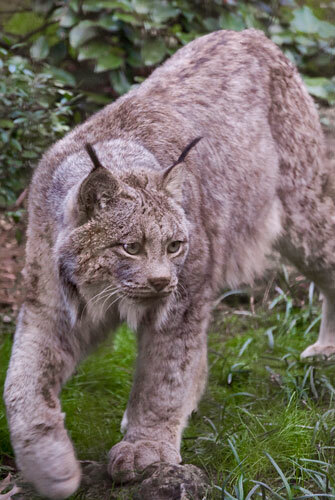 Threats: Since Canadian lynx are only medium-sized predators, they face threats from other animals of the forest. Large carnivores such as cougars and wolves are direct predators of the Canadian lynx. 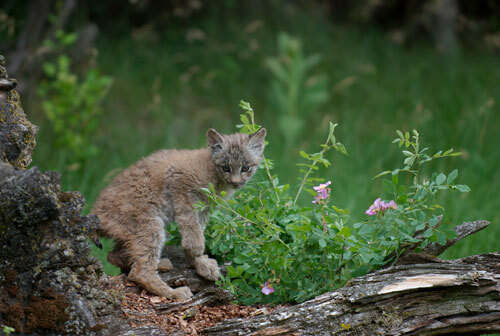 Coyotes, although relatively small, may also hunt lynx. Other animals theaten the Canadian lynx because they compete for prey. Animals like coyotes and wolverines may try and steal prey from the lynx. Wolverines are very aggressive and will scare lynx away from prey that they have caught. Luckily, lynx can use different adaptations, like their whiskers, to detect incoming predators while they are hunting. Aside from animal threats, the Canadian lynx's main threat comes from human impact and loss of habitat. 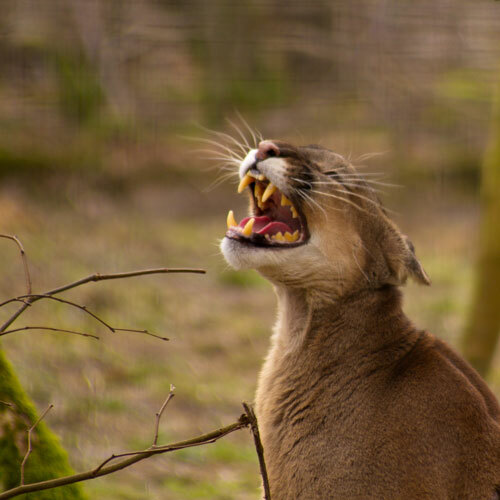 The urban sprawl of mankind has extended into a lot of forest areas, cutting off the lynx from paths through their habitat or destroying their home altogether. In the United States, Canadian Lynx are a threatened species due to current urbanization and a history of overtrapping. 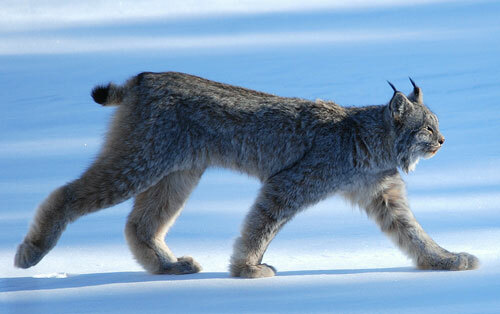 When the Canadian Lynx catch their prey they may decide to save some of the animal under layers of snow to eat later. Lynx are very mysterious animals and have earned themselves the nickname "shadow of the forest". Sometimes lynx will surprise their prey by pouncing them from tree branches! The Canadian lynx and the bobcat are very similar wildcats. Lynx make noises much like those of a domestic cat: purring, hissing, and meowing. In the wild the Canadian Linx have a lifespan of up to 15 years. In captivity they can survive even longer—up to 25 years!